The Rosary is quite likely one of the most effective devotions ever made available to us. That's a pretty bold statement, especially given the incredibly rich treasury of Christian prayers and traditions. If you're one of the many people who have received a Rosary from us, you may even be pretty skeptical about faith in general, let alone about the Rosary. We get that, and it's OK. Really. May this appeal of mine not go unheard! To unite your Rosary prayers with others, it is highly recommended to enrol (no charge) in the Rosary Confraternity. Learn more about the benefits and obligations of membership in the Confraternity by clicking here. Our Rosary Prayers page explains how to pray the Rosary from start to finish, but it is important to mention that when praying the Rosary we meditate on 15 different mysteries of the Christian faith taken from the life of Jesus Christ in the Gospels. Paul VI, writing about the benefits of meditating on these mysteries while praying the Rosary, stated that recalling "these same mysteries to the mind of the person praying stimulates the will to draw from them the norms of living." What Paul was saying was that a true devotion to the Rosary helps one to live life in accordance with the Gospels. Contemplation in communion with Mary, of a series of mysteries of salvation, wisely distributed into three cycles [i.e. 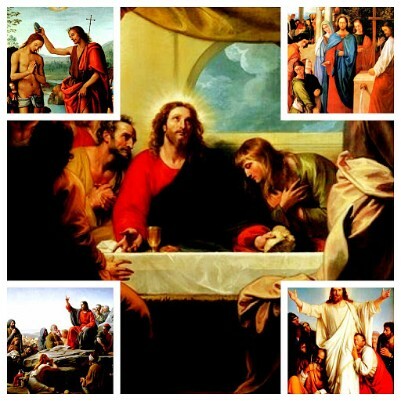 the Joyful, Sorrowful and Glorious Mysteries]. These mysteries express the joy of the messianic times, the salvific suffering of Christ and the glory of the Risen Lord which fills the Church. This contemplation by its very nature encourages practical reflection and provides stimulating norms for living. The Lord's Prayer, or Our Father, which by reason of its immense value is at the basis of Christian prayer and ennobles that prayer in its various expressions. 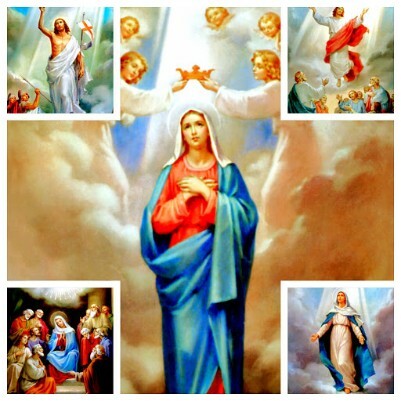 The litany-like succession of the Hail Mary, which is made up of the angel's greeting to the Virgin (cf. Luke 1:28), and of Elizabeth's greeting (cf. Luke 1:42), followed by the ecclesial supplication, Holy Mary. The continued series of Hail Mary's is the special characteristic of the Rosary, and their number, in the full and typical number of one hundred and fifty, presents a certain analogy with the Psalter and is an element that goes back to the very origin of the exercise of piety. But this number, divided, according to a well-tried custom, into decades attached to the individual mysteries, is distributed in the three cycles already mentioned, thus giving rise to the Rosary of fifty Hail Mary's as we know it. This latter has entered into use as the normal measure of the pious exercise and as such has been adopted by popular piety and approved by papal authority, which also enriched it with numerous indulgences. The doxology Glory be to the Father which, in conformity with an orientation common to Christian piety concludes the prayer with the glorifying of God who is one and three, from whom, through whom and in whom all things have their being (cf. Romans 11:36). As things stand now, therefore, praying the Luminous Mysteries is entirely optional. For those who prefer the older weekly schedule for the Rosary (see "More Information" section, below), but wish to include these optional mysteries, the least disruptive approach may be to simply add the Luminous Mysteries to the Joyful Mysteries on Thursdays. Alternatively, one may pray according to the revised weekly schedule incorporating the Luminous Mysteries (see the section on Luminous Mysteries near bottom of this page). Remember though - one may simply pray only the traditional three sets of mysteries, and omit the Luminous Mysteries entirely. Any of these options is perfectly acceptable for private prayer and fulfills one's Confraternity obligations; however when the Rosary is recited as part of a public procession or in a Church after Mass, the newer schedule (including the Luminous Mysteries) is usually followed. Familiarization with the Luminous Mysteries is therefore recommended. Sunday: Joyful Mysteries from Advent until Lent, Sorrowful Mysteries Lent through Easter, and Glorious Mysteries from after Easter through to the start of Advent. 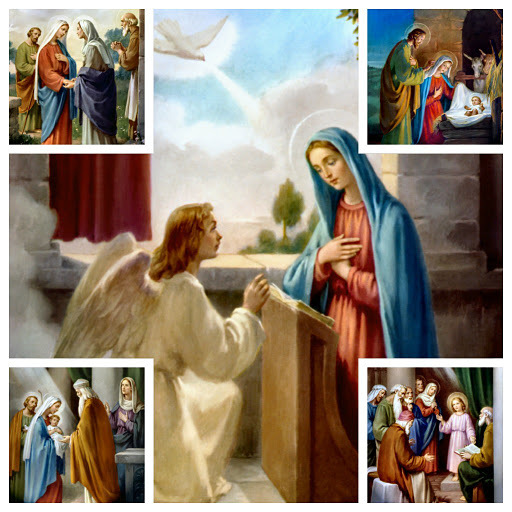 Information on all the Mysteries of the Rosary is below, along with pictoral collages that can help you meditate on the mysteries while praying (images are all in the public domain; right-click to download). The Joyful Mysteries are prayed on Mondays, Thursdays and Sundays from Advent until the beginning of Lent. 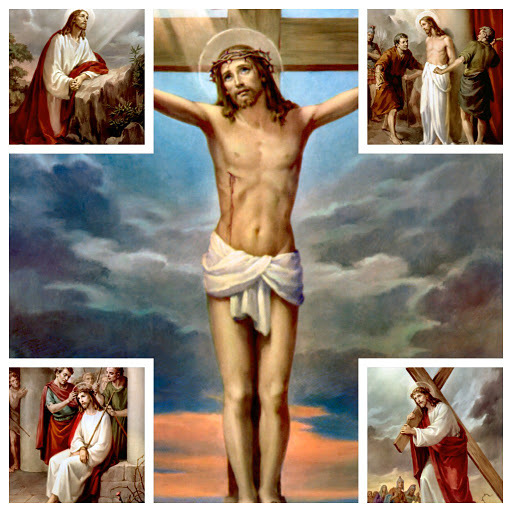 The Sorrowful Mysteries are prayed on Tuesdays, Fridays, and Sundays of Lent. The Glorious Mysteries are prayed on Wednesdays, Saturdays and Sundays from Easter until Advent.